"When I first began this work, my aim was to provide a simple chronicle of my family, a potted history for my great nephews and nieces who had little knowledge of how their forebears had come to the Antipodes. The truth was I lacked much knowledge of those forebears myself. I did not know what I was to encounter. I began with a few resources but quickly found I needed many more. And the story expanded. I found I was no longer writing a chronicle; instead, I was telling the story of people with faith, people who came from a history of discrimination and prejudice who sought the freedom to worship as they saw fit in new lands ... As a writer, in assembling this work I began to discern stories that I had no or insufficient facts to be able to recount as history, so I took the liberty of imagining scenes to help illuminate unknown or undocumented aspects of events. These small fictions are simply that, though supported by research into time and place. The work stands as an example of writing practice combining fiction and non-fiction techniques. What I wanted to demonstrate was that biography, history and fiction can co-exist in narrative ... Since I also teach publishing and editing, I have also completed this work as an example, an artefact, of editorial and publishing practice. The book has been typeset and laid out by me using InDesign, a professional design and production tool for the publishing industry, and follows Australian editorial conventions as set out in the Commonwealth of Australia Style Manual (2002) ... The index follows Australian and New Zealand Society of Indexers conventions. Lastly, the book is printed using environmentally acceptable paper." Jeremy Fisher's new book, The Dirty Little Dog, was published in May, 2016. Read the review in The Age and Sydney Morning Herald here. Fat Frog Books, PO Box 229 Haberfield NSW 2045 Australia. Cheques payable to Jeremy Fisher Publishing Services ABN 30 617 885 472 t/a Fat Frog Books. 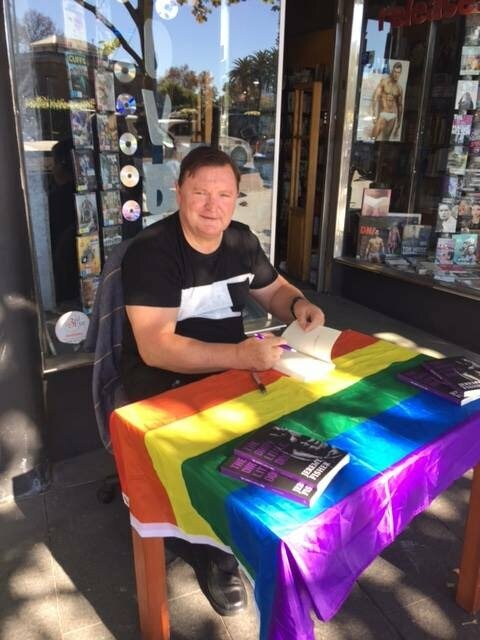 Jeremy Fisher signs copies of the book at The Bookshop, Darlinghurst (photo courtesy Les MacDonald).